From left: Shawn Casey, Finn president/CEO; Jason Miller, RoadBuilders Finn product specialist; and Bryan McCoy, RoadBuilders VP. Finn Corp. recognized dealers for their excellence in partnership, leadership and growth at its annual Dealer Sales & Executives Conference in the Cincinnati area earlier this month. 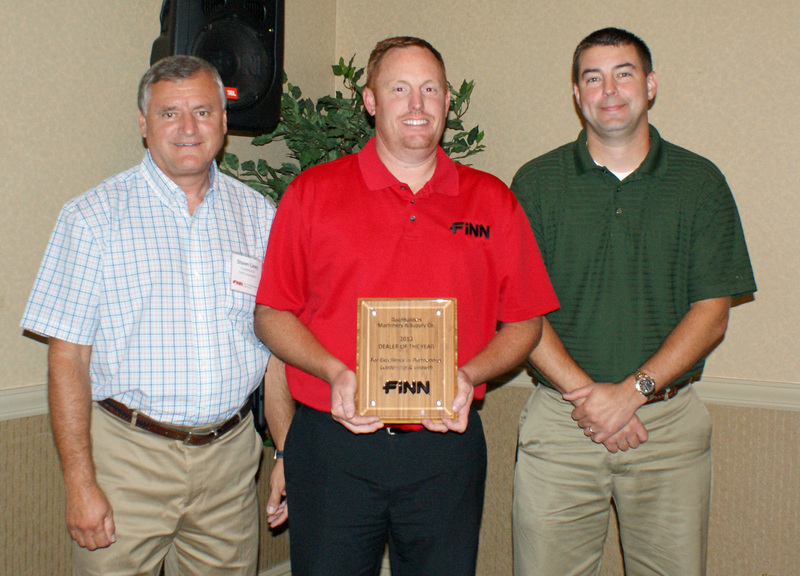 Receiving the Finn Dealer of the Year Award was RoadBuilders Machinery & Supply Co. of Kansas City, Kan. In addition to this accolade, RoadBuilders also was named the Finn Consumable & Mulch Dealer of the Year. RoadBuilders sells, rents and services all Finn equipment, plus it caters to the hydroseeding consumable and mulch markets. In other awards, the dealer of the year runner-up was hydrograsscorp.com, a Finn dealer that covers the New England area. James Loneman was recognized for his performance in working with his dealers as a distribution sales manager. The Dealer Advisory Council, a five-member group of elected dealer representatives who act as a liaison between the dealer network and Finn, bestowed the Jerry Malcolm Dealer Choice Award to Tim Gerbus for his exceptional service and commitment to the dealer network. Conclusively, the dealer network gave commemorative gifts to Ed Karendal, sales administrator, and Tom McDonald, CFO/executive VP, as they approach their retirements. Karendal has been with Finn for 30 years and McDonald more than a decade.